We are engaged in offering Hoof Cutters. 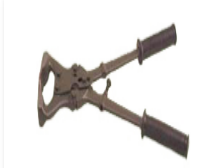 Goat Hoof Cutter - 10"
Will help you keep the hooves of your livestock healthy and prevent foot problems and lamenessfrom occurring. With regular inspections and the right tools, hoof trimming and treatment neednot be difficult tasks.